This afternoon I made my first visit to the Main Press Center (MPC), which is located about 40 minutes from the press housing. This is a bit inconvenient, since so many of the press offices and transportation is located here and I will have to come here often. But at least the press buses have WiFi so I can retouch images and write blogs while making the trips back and forth. 2. I needed to go see my friends at Canon Professional Services to pick up my loaner gear, which includes a couple of Canon 1D X Mark II cameras and the Canon 200-400mm lens. I also was able to go behind the scenes of their operation, and that blog is coming soon. 3. The women from USA Hockey were having their press conference here, and I needed to cover that. This is a photo from out side the MPC which is located in the Alpensia area. I was greeted by the Olympic mascots as I entered the building. ... and the blue area is for editorial writers. There are lots of help desks for us, and the people have been very organized and helpful. They have numerous snack bars and restaurants in the MPC, and I heard that there are decent places to eat outside, but I have not been out there yet. 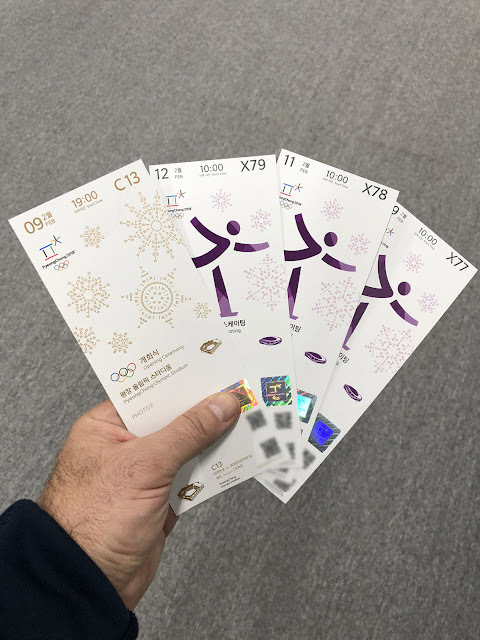 Oh, and the good news is that I got my tickets to Opening Ceremonies and the ice skating events. Check that off my list. Thanks for these fascinating blogs. The behind the scenes pictures and stories really bring the Olympic experience to life.